Welllll, I belong to a ton of groups and get to hear a TON of chatter on stuff. 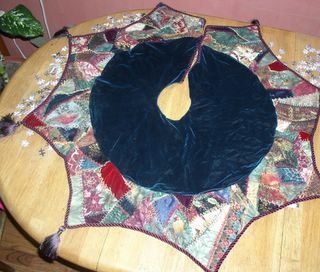 My current ramblings are about what stitches are favorites and then the ever present problem of people that don't return blocks that go out in a round robin. Enough on THAT soap box....on to something LOTS more fun....my favorite stitches! One friend asked what ones we all favored in our group. Well, admittedly that got me thinking....and I don't really have just one! I LOVE to explore and find myself doing a lot of variations on them. The ones I typically use are the herringbone, fly, buttonhole, feather and pearl knot stitches. Heck....I am obviously REALLY slow, cuz it was just today that I actually figured out the differences between the fly stitch and the cretan!! LOL!!! Sharon B's, In a Minute Ago stitch index helped clear it up! I feel so silly cuz i've been stitching for YEARS.....oh well....guess its good to keep on learning! I would LOVE to hear what others think! What are your favs? At loooooooonnnnngggggg last, here I am!!! Back at the ol' bloggin ranch!!! What have I been up to during this horrific absence, you ask??? Wellllll.....I had to have a second back surgery...which wasn't great fun and kinda laid me up....then there was the holidays and all the "stuff" that's involved with them, plus I worked in a couple three meetings with a new group I helped found...the Rocky Mountain Crazy Quilters. I've finished a couple...well, more than that technically, projects which I shall endeavor to post here if I can just remember HOW!!!!! Sooooo, anywhoo.....much thanks to the ever persistent Mary Frances of Frequently Wrong But Never In Doubt fame for getting me back to my cq senses!!!! 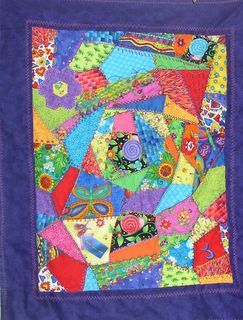 As to the future....wellllll, i'm starting the 2002 Piecekeepers quilt with all the appliqued trees and cq blocks and such. I hooked up with Mary Frances on this one too....we're going to reward each other if we make our goals of two blocks per month! The reward being a bottle of wine. Hmmmm.....could make for some interesting stitching! LOL!!!! Wellll, off to figure out how to get the pics in here and get started on supper!!! Later gators!! !